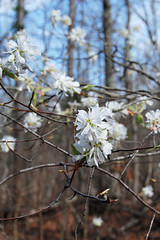 In the very early spring, before the leaves begin to show on any trees of the forest, you will see trees in the forest understory covered with white flowers. Some might think these are a fruit tree like a plum or perhaps even a dogwood. But no. 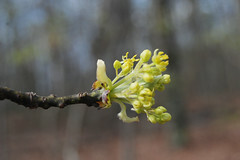 If you get a chance, take a look at the flowers up close. 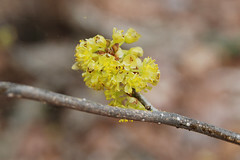 This entry was posted in Trees, Trees in Bloom and tagged Amelanchier arborea, Bell Mountain Wilderness, Downy Serviceberry, Flowering Tree, Ozarks, Spring, White on April 9, 2012 by Ginger.